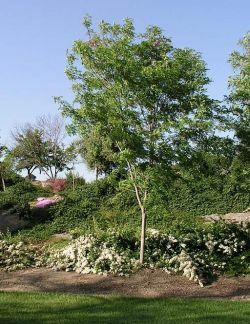 Comments: Hybrid broadleaf deciduous tree native to North America. This species has showy magenta flowers, dark green compound leaves, and a gray bark. Medium spreading to 40' tall, this species is drought tolerant, and will grow well in our climate. The parents of this species are R. pseudoacacia and R. viscosa.